That’s just one of the great lines featured in the documentary King Corn. Yes, I have a one-track mind. And it’s set on learning as much as I can about our food system, and what’s wrong with it, so I can influence people to smarten up and think before they eat. Not only for the planet and the animals that inhabit it, but for their own health as well! The documentary was created by two local guys (inspired by Michael Pollan’s work) who decided to go out to Iowa and grow an acre of corn. During this process, they learned about how farming in the Midwest has drastically changed in the past generation and where the corn grown out there ends up. Here’s the super-abbreviated answer: a small part of the corn becomes ethanol. A large part is used to quickly make feedlot cows fat. More on that in a second. A larger part is processed into high fructose corn syrup, which can be found in almost every processed food we eat, especially soda. In a nutshell (or should I say corn cob? ), corn is America’s crop, and it has taken over. It’s all about the bottom line instead of our health and well being. Back to the cows. You’re probably wondering, why do I care what cows eat? Cows are made to eat grasses, which is why they have a rumen (specifically there to digest plants, such as grass). Grain isn’t part of their diet. Feedlot cows are fed a diet that’s primarily corn. Because corn is high in starch, is causes their stomachs to become more acidic, which causes health problems for the cattle. To paraphrase someone from the film, feedlot farmers are killing the cows by feeding them so much corn, so it’s a good thing they get slaughtered young since they’d die anyway. How does that affect us? First, corn-fed beef is much higher in saturated fat than grass-fed beef. This is due to the food they eat and the limited space the cows have to move. Meaning they don’t get exercise, while at the same time stuffing their faces with starch. Second, these feedlot cows are given antibiotics to help them fight the stomach disease–acidosis–caused by the corn diet. This is one reason that disease has become so prolific – due to all these antibiotics we unknowingly ingest, the viruses become resistant to antibiotics. Third, feedlots create TONS of pollution that threatens public health. So why so much corn? (And yes, I’ve blogged about this before.) The government makes it so that growing many acres of corn is more profitable for farmers than growing any other crop. That’s why the “family farms” of yesteryear have become fields of corn as far as the eye can see. It’s also why high fructose corn syrup has become the number one sweetener. For more on this and how the corn subsidy came about, click here. I highly recommend you read this article. Mr. Max, you will be missed. But not by the dogs in our neighborhood. This is my attempt to turn something that’s been depressing me into something amusing. Call it an ode to Max. For those who may not know about Max’s story, here is the quick summary: We adopted Max last May from a Shelter in New Hampshire. Since day one, he had various health issues, most of which we could resolve with traditional veterinary treatments. There was one we couldn’t fix, and it had started plaguing him last October. He was itchy. Extremely itchy. Like tear-himself-apart-if-left-to-his-own-devices itchy. We tried four different vets, including a dermatologist and a holistic vet who practiced applied kinesiology. We were told everything from scabies to food allergies to compromised immune system to tick disease to environmental allergies to yeast infection. We were even told he was allergic to life and was “a lemon.” We tried crazy diets, weird drugs, vitamins and minerals, and none of it worked. So we finally made the difficult decision that most pet owners must face at some point. 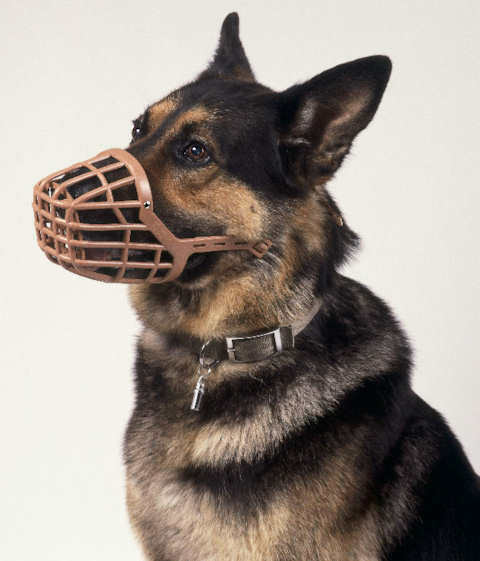 Max couldn’t tell us for sure, but we knew he wasn’t thrilled with a life of being poked and prodded, taking medications that bothered his stomach, being yelled at every time he tried to chew himself, wearing a basket muzzle every night, and having to wear the e-collar whenever we left him alone. Never mind his joint issues or the fact that he didn’t seem to be able to gain weight. The stress of dealing with Max’s seemingly unsolvable problems and hoping time after time that something would work just to be disappointed when it didn’t wore on us as well. It’s been a little over a week since we put Max down, and I’m still struggling. I won’t blather on about how much I miss Max or how guilty I feel about our decision. Instead, I’ll try and remember a few things about Max that bring a smile to my face. Max’s water and food bowls sat in a wire holder on top of a box in the corner of our kitchen, so he didn’t have to bend down to drink or eat. He also had a glow-in-the-dark bouncy ball he loved to play with. In mid-play, he’d sometimes get thirsty, so he’d go to his water bowl to drink. But he didn’t want to give up his ball either. So he’d strategically place it beside his water bowl, under the wires and on top of the box, so we couldn’t steal it from him. Sometimes it took him several tries to get the ball in the perfect spot. When he was done drinking, he’d grab his ball and walk back over to us, leaving a trail of water and drool behind him. He also liked to play alone with the bouncy ball. Because it was rubber with a hole in the center, he could clench it between his jaws and make weird squeaky n oises. (He’s doing that in the photo here.) One of his favorite things to do with the ball was dribble it. He’d stand on the hardwood floor and drop the ball so it bounced right back into his mouth. His aim was spot on – he almost never missed. Max was smart, too. If we said “get your ball,” he would start searching the house for it and eventually find it. At that point he’d either start dribbling it or bring it to us and push it against our legs, only to not let us have it. Then there was his barking. Yes, it was loud and intimidating. But I don’t think anyone was witness to the breathless bark. Usually this happened when he woke up out of a sound sleep to bark at something. He’d bark until he ran out of breath and his bark became a whisper. Sometimes the bark would even start out a little hoarse, like your voice might when you first wake up. It would take a couple rounds for him to reach his full potential. One time in particular, he stood up and barked so many times in a row that he ran out of breath. Or maybe his breath decided to come out the other end, because he immediately farted. And it was loud. He then proceeded to look back toward his rear in accusation. How dare you steal my thunder! Last summer we took Max camping for one night. We slept on an air mattress and Max slept on his bed on the floor of the tent. Sometime after 5 a.m., Max decided the air mattress was the place to be, and he awkwardly stumbled over the mattress and plopped down full-length right between us, his back to me and his legs stretched out and pushing against Jay. There he stayed, snuggling between us and taking up most of the bed, until the air mattress became just plain mattress. Every time we changed the sheets on our bed at home, Max was right there to stretch out on the comforter. Max was polite as well. He’d look back at us during walks to make sure we were still there. He’d always let us walk through the baby gate before him. And any time I’d refill his water after he finished what was in the bowl, he’d bring his nose up to mine as a thank-you before he resumed drinking. Those are just a few random memories off the top of my head. Max was a sweet and funny oaf who was loved by every person who met him. I have to assume he’s in doggy heaven, itch-free, magically able to get along with other dogs and romping around with them.